Shirts With Random Triangles: Pitt Gives Head Coach Pat Narduzzi A Two-Year Contract Extension. 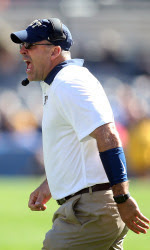 Pitt Gives Head Coach Pat Narduzzi A Two-Year Contract Extension. Pat Narduzzi. Image via pittsburghpanthers.com. Pat Narduzzi has only been head coach of Pitt for one season, but he has already earned a contract extension. Pitt went 8-4 in Narduzzi's first season as head coach, an improvement from a 6-7 record in 2014. The Panthers' ACC record also improved, going 6-2 as opposed to a 4-4 record last season. Pitt wii face Navy in the 2015 Military Bowl at Navy-Marine Corps Stadium in Annapolis, Md. on Dec. 28.